Fig. 1. Both fasting and the ketogenic diet induce a number of common changes in the body. These include an elevation of ketone bodies in the blood and brain, a decrease in glucose utilization, and a shift in electrolytes and hormones. The identification of specific changes resulting in anticonvulsant effects has been challenging. Fig. 2. 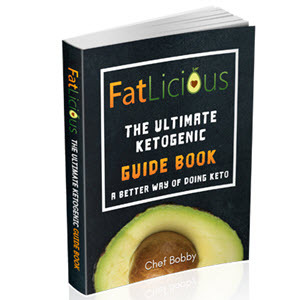 Biochemical pathways that generate "ketone bodies and approximate concentrations of 'ketones' in blood, plasma, or serum." (In chemical terms, acetone is the only ketone among the three ketone bodies; see text.) Acetoacetate is the key molecule from which both P-hydroxybutyrate and acetone are derived. P-Hydroxybutyrate, however, is the most commonly measured ketone body. The blood and brain concentrations of acetone in patients on the ketogenic diet are imperfectly known. P-hydroxybutyrate varies over a wide range in plasma of patients on the ketogenic diet, reaching values of 2-5 mmol/L (9). P-Hydroxybutyrate blood concentrations of 5-8 mmol/L have been reported in humans undergoing prolonged fasting (6,8). P-Hydroxybutyrate is in equilibrium with acetoacetate owing to a reaction catalyzed by the enzyme P-hydroxybutyrate dehydrogenase (Fig. 2). In the "fed" state, the ratio of P-hydroxybutyrate to acetoacetate is close to 1:1. 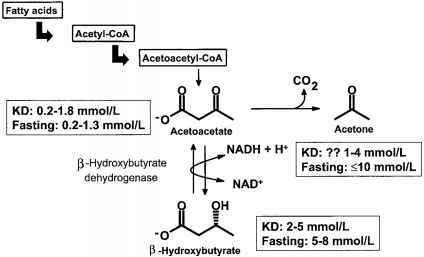 As ketosis increases, however, the ratio of P-hydroxybutyrate to acetoacetate increases as well. After 28-42 d of starvation, it may be as high as 4.5:1 (6,10,11). toacetate pool, replenishing it during periods of peak demand. In adults undergoing prolonged fasting, acetoacetate in the blood rises to a maximum of about 1.3 mmol/L (6). In children aged 2-9 yr, Huttenlocher, in 1976, reported fasting plasma levels of acetoacetate of 1.66 mmol/L; ketogenic diets—classic or medium chain triglyceride (MCT)—subsequently maintained acetoacetate levels in these children in the range of 0.95-1.84 mmol/L (9). It is worth noting that when applied to P-hydroxybutyrate or acetoacetate, the term "ketone body" is not quite accurate. Defined from a strict chemical basis, P-hydroxybu-tyrate is not a ketone. It is an organic acid containing an additional alcohol group. Ace-toacetate is also an organic acid, one that contains an additional ketone group. 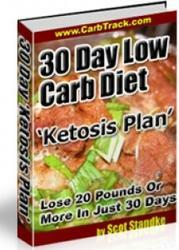 It is traditional practice, however, to refer to both compounds as "ketone bodies," or "ketones" for short. Acetone is the only "true" ketone among the three ketone bodies. Acetone is formed from acetoacetate by an irreversible reaction involving the spontaneous loss of a carbon as CO2 (Fig. 2). This reaction is not in equilibrium. It may therefore lead to the accumulation of acetone in the body. Some data suggest that the serum concentration of acetone during fasting can be as high or higher than 10 mmol/L (12). Very little is known about the blood/serum/plasma or brain acetone concentrations induced by the ketogenic diet. Acetone has long been considered to be a minor ketone body, with little biological significance. An early study, however, found that in children treated with 2:1 to 5:1 ketogenic diets, blood acetone concentrations were in the range of 0.071-0.935 g/L (4). These concentrations correspond to concentrations of 1.2-16.1 mmol/L. These data should be viewed cautiously, however: the authors provide few details about the specificity of their analytical methods or the conditions under which blood samples were stored before analysis. More recently, nuclear magnetic resonance (NMR) spectroscopic measurements in patients on the ketogenic diet have suggested that the concentration of acetone in the brain is about 1 mmol per kilogram of brain weight (13). Our own measurements, utilizing the NMR and high-performance liquid chromatography techniques on plasma samples from patients on the ketogenic diet, suggest a large range of acetone concentrations, in one instance exceeding 8 mmol/L (see Fig. 3, unpublished data, derived from samples provided by K. Musa-Veloso and Drs. S.C. Cunanne, R. Curtis, and R. Wennberg).